The painting shows an abandoned timber hay barn in a dairy farming area of the state of Victoria, Australia. Against a blue sky, the heavy timber roof of the building is supported by warping tree trunks, in imminent danger of collapse. They are backed by segments of corrugated iron which is also used in the holed and rusted water tank to the left. The ceruleum and cobalt blue timber stall in the foreground once held the cattle waiting to be milked. The painting was begun on a Belgian linen canvas with a white acrylic priming using acrylic based pigments. The artist's plan was to conceive of the painting as a series of vertical lines represented by the pillars supporting the roof and the lines of the posts forming the uprights of the stalls. Sufficient movement and interest for the eye is provided by the irregular nature of the sagging timbers and the textures of the upper section. 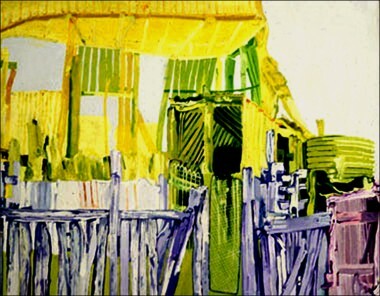 The acrylic technique provides clean graphic design in the lower foreground relieved by the violet tints of the shed on the left. These give way in the middle portion, to light-green timber posts lightly painted in oils against the corrugated iron rear walls which are themselves in acrylic. A number of the support posts in the upper section are silhouetted in strong green.Extensive use of impasto and the wet-into-wet techniques of oil painting is visible in the upper section. The cross beams are indicated by gouging out the background colour with a loaded brush and using a number of transparent yellows and yellow orange. This painting formed part of a series of three works carried out in the open in Heyfield - an old hardwood timber and cattle town in the goldfields belt of the state of Victoria - including one canvas larger and one smaller than the present. The yellow barn with its emphasis on primary colours, fight blues, greens and yellows, is the more formally abstract of the three. The textured nature of the upper section contrasts with the blueprint‑like or diagrammatic style of the remainder (particularly the complex play of vertical and horizontal posts in the lower left section painted in a mixture of acrylic and oil based cobalt blues) and gives it a sense of constant movement.